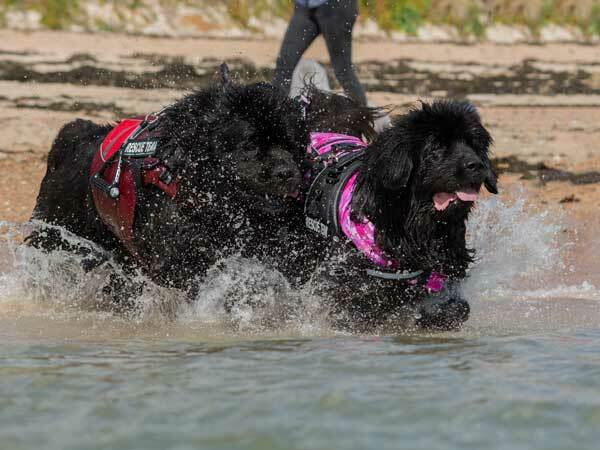 A total of 22 dogs were tested at all levels at The Activity Centre in St Martin, Level 4 and Level 3 Hauls were held in and around St. Catherine's Wood area. The woods have several different surfaces, streams, rocks, steps and inclines. The Level 2 Haul was held at Victoria Tower next to the Activity Centre. The weather was a mix of sunshine, cloudy skies and wind. Thank you to all those that came over to support, judge, steward and to generally help out. A special thanks to Paul and Ruth for the supply of bacon rolls, tea and coffee etc.. Also thanks to Helen and Anita for going the extra mile. Good to see 100% success rate today at Jersey, in the early autumn sunshine. We had both young and more mature dogs with varying experience. All dogs seemed to settle down, and perhaps their handlers too, in the second half of the control section. Thank you SNC and Jersey Big Dog Club for inviting us to judge. Thank you SNC for asking us to judge at this event. We had a total of seven entries (one in Brace) at this level today, with unfortunately one fail, due to the dog leaving the ring during the control section. Lots of points were lost throughout the test for tight leads and dogs not being alongside the handler, however this will be overcome once more experience at entering tests is gained. Thank you JBDC for a fab test a great venue & good weather. A lovely venue for the test, five dogs entered, two finished; there were various reasons, but all entrants had given a good showing. The two that passed did so really well, showing true team work and drive throughout the test. Thanks to Gill, my co-judge, the stewards and special thanks to the JBDC for the chance to come and judge. Hope to see you all soon. My first time judging in Jersey and I thoroughly enjoyed it. St. Catherine's Wood is a lovely venue and I think myself and my co-judge gave the entrants something to think about and indeed some different things to try. Hopefully they learned a few things along the way. Entrants need to keep in mind that all we ask you to do is get from one place to another. Unless we say we want you to take a set route, then it is entirely up to the team how they do this. On the day we did not have any passes this was because of the back up & down stays. However it was a great attempt by the teams. Thank you Marcus Sutherington for judging with me. My first time judging draught in Jersey. What a great venue and hosts. We had two dogs, unfortunately both failed on the down stay although both of these dogs were well prepared and ready for this level and will go on to pass in the future. The control section was held at the Jersey Activity Centre. We judged two entries, one was successful on the control section and completed the down stay, the other dog did not pass as the back-up did not meet the required standard this time. The haul took place mostly in St Catherine's Wood, which proved to be a very strong test. The team had to negotiate some very difficult obstacles, which they did very well, going through streams, over logs and unhitching to go over a high rock formation. 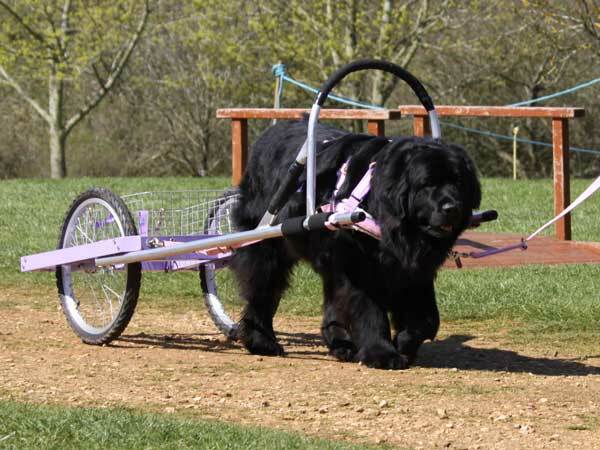 The incline with a load was taxing for handler and dog. We saw some very good instructions and control from handler to steward and dog. Thank you Jersey Big Dog Club for the opportunity to judge.